For superior performance and a long life span it is important that you maintain your bowling ball with regular cleanings. The Tac Up Bowling Ball Cleaner will remove dirt and grime from your ball while restoring the ball's natural tack to give you consistent ball reaction roll after roll. For best results spray Tac Up directly onto the ball surface and let sit for at least 5-10 seconds and wipe clean using a towel. By Jim from W. Pa. I apply the tac up before i bowl. i apply it, spred it all over the ball, wait a few minutes then buff with a clean cloth. By johnny b from Abilene Tx. I don,t believe there is any better cleaner on the market. tacup do you sale in a bottle 8 oz. Do you sell Tack-Up in gallon quantity? Please reply...I never get a reply from you guys...I always enter my E-mail address. Unfortunately, we only sell it up to 32 oz. 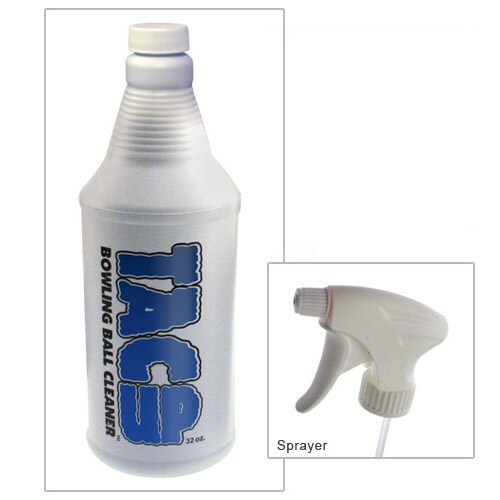 Due to the time it takes to produce the Tac Up Bowling Ball Cleaner 32oz ball it will ship in immediately. We cannot ship this ball outside the United States.